I have a confession: I read a lot of blogs that make me angry. And here’s another confession: I don’t plan on stopping. But not for the reason you might think. First of all, let’s talk about hate reading. I have a theory that anyone who spends a lot of time on the internet (yours truly included) will eventually accumulate a couple of hate reads along the way. This is a documented phenomenon. Last year, Jezebel (the notorious comments sections of which may themselves serve as a hate read, in a pinch) posted an article called “The Art of Hate Reading,” in which the author discusses the habit of “visiting a website, Twitter feed, or Facebook page for the express purpose of ridiculing — or indulging your disdain for —the author and/or content.” I do this. Oh, do I do this. I have a whole section set up on my Feedly reader devoted to these so-called hate reads, and they’re the first blogs I read every morning. They get the blood pumping, you see. 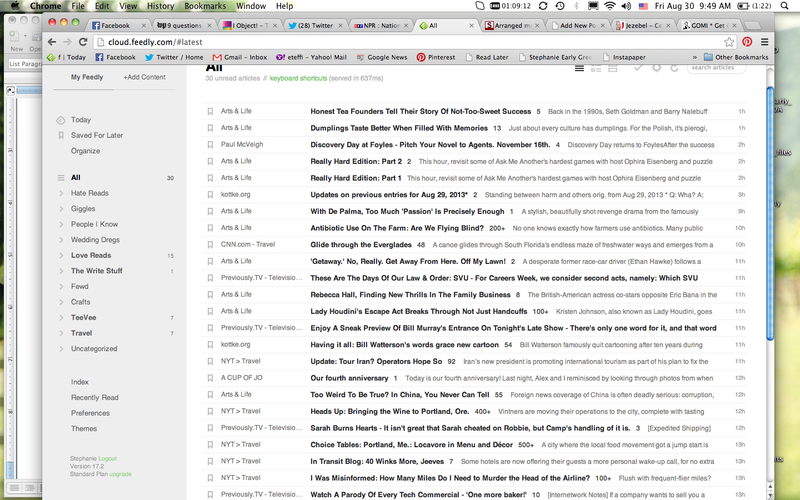 My Feedly reader – note separate categories for Hate Reads and Love Reads. I’ve already read the Hate Reads. The flip side of hate reading is that if you stick around long enough, you’ll get exposed to communities and ways of thinking that you’ve never before encountered, up close and personal. This can be off-putting, but also fascinating. I think of reading these blogs as a type of amateur anthropological study. Consequently, the exposure to communities of crazies on the internet has informed my thinking and, more importantly, my fiction writing. After all, it’s the extreme examples of weirdness that I find on the internet that provide fodder for some of my more interesting characters. If you spend enough time on blogs, reading posts and comments, you start to get a real sense of how certain people — people you’d never meet in real life — think and talk. And that’s a pretty valuable resource for a writer. You know that old chestnut “write what you know?” If you stick to only writing about people you know in your own life, the landscape of characters in your fiction might start to get a bit dull. Of course, it’s not that everyone I know in real life comes from the same background or holds the same beliefs, but generally, there’s some truth to the saying that birds-of-a-feather flock together (and I don’t mean that in some weird, covertly racist way). The fact is, the majority of my close friends are American, around my age (late 20s, early 30s), highly educated, politically moderate, agnostic, or liberal, and non-religious and/or non-devout (or, if they are religious, I’m not aware of it). Trust me, they’re all fascinating, wonderful people and they make my life infinitely better. But you don’t come across a lot of surprises when you hang out with people with similar backgrounds and beliefs to yours. That’s where the internet comes in. When you say your friend mouthed off about homosexuality, do you know exactly what he said, and how he said it? I ask because while I agree with your observations that freedom of speech should be sacrosanct and that Catholics have the right to believe (and, in my view, should proclaim) that homosexuality is an evil perversion, I also believe that we should not pour vitriol on those who are tempted into such a life, but rather should help them repent from it. It seems to me that it is all too easy to forget one half of the maxim ‘love the sinner, hate the sin’, and easier still to express one sentiment in a way that crowds out the other. If your friend was among the homosexuals at the perversely-named ‘pride’ event, trying to befriend them and at the same time enlighten them about the immoral and destructive nature of their activities, I salute him, and condemn those who set out to silence him with their drugs. I pray they didn’t sodomise him while he was under the influence, and if they did, that the does not now have HIV as a consequence. I think if I had read this almost comically ignorant comment a few years ago, before I was an old pro at hate reading, I would have choked on my morning hardboiled egg/done a coffee spit-take/slammed my forehead on the keyboard repeatedly, etc. But now, I just find it fascinating! I mean, if I ever need to create a well-meaning but outrageously homophobic character in a book, I know exactly how he’ll talk and exactly how he’ll spell the word “sodomise” (the British way, apparently). You can’t make this stuff up… but you can learn from it and use it in your fiction. So, to my fellow hate readers, I say go forth and hate read. And then take all of your frustration and pour it into great writing. That’s what I’m trying to do. This entry was posted in Writing and tagged blogs, fiction, hate reads, internet, writing on August 30, 2013 by Stephanie.